Fight germs and bacteria by ensuring that you are always equipped with ample Purell hand sanitizers. You don't want to settle for discount hand sanitizers that are less effective when you can trust Purell, the brand which kills 99.9% of all the germs that cause common illnesses. Purell hand sanitizers are alcohol based, leaving no oily residue behind on hands after use. These Purell refills are designed for ease of use. They have a non clogging spout and a no leak pouch so you can be sure to have a clean and easy time using Purell refills to restock your dispenser units. The more aware we become of the germs in the world around us, the more hand sanitizer brands spring up as competitors to Purell. Walk into any hospital though, and you will see that they don't trust discount hand sanitizers, and prefer hand sanitizer brands which have stood the test of time. Trust your health to Purell, the leader in hand sanitization. Kills 99.99% of germs on hands, not just in the lab. 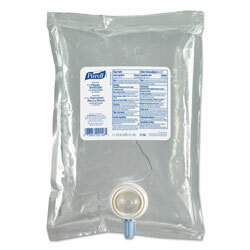 Sanitary Sealed™ refill bag conforms to interior of PURELL® 1,000-ml NXT® Dispenser (sold separately). Formulated with 70% alcohol plus moisturizers. Four out of five healthcare workers said PURELL® Advanced Skin Nourishing formulations left their hands feeling soft. Dermatologist tested and compatible with CHG, latex, nitrile and vinyl. Stock up and save! Hand Sanitizers Type: Liquid; Color(s): Clear; For Use With: PURELL® 2120-06; Capacity (Volume): 1000 mL. INNER PACKAGING: 8 Refills. 1,000 mL per Refill. mL - 1000 Hand Sanitizers from Purell! 1293 In Stock today.